5/18/17 – Puma fire receiving significant precipitation today in the form of snow, an estimated 6-8 inches currently on the fire. No smoke showing. Due to road conditions fire engines were not on the fire today. Forest Service employees were able to get to the edge of the fire to verify snow cover. Containment percentage now at 100%. 5/17 mid day update: Much cooler temperatures today and expecting moisture this evening. Hotshot crews are being released at noon today. 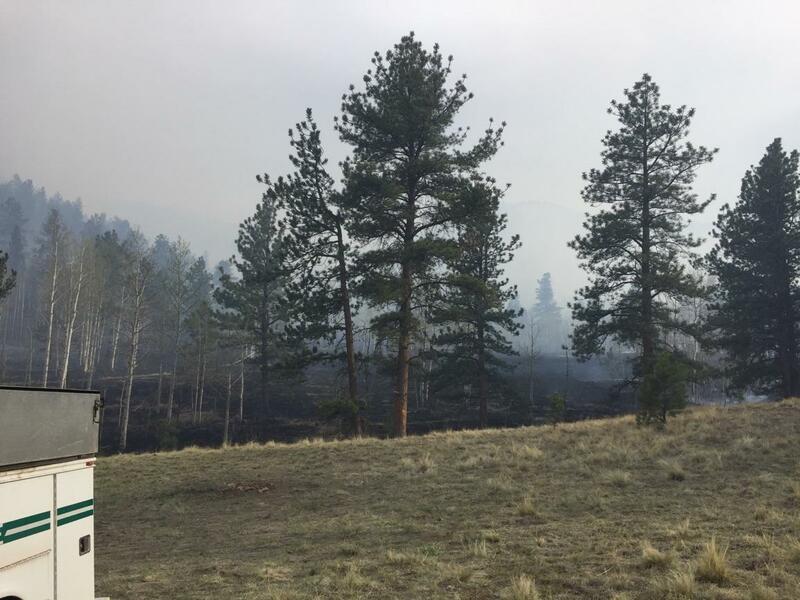 Fire is now fully managed by the South Park Ranger District resources. Crews will be mopping up hot spots close to the fire line working on making it more secure. Due to the large patches of standing dead trees (snags), crews will allow the fuels in the interior of the fire burn. Fire was gps’d at 107 acres. 5/16 evening update: Crews made good progress today securing the fire line bringing the fires containment to 50%. Several crews and engines have been released today leaving 58 firefighters and miscellaneous overhead assigned to the fire. The fire received minimal moisture this afternoon which settled the fire behavior some as well as dissipated some smoke. Tomorrow crews will continue to secure fire line and mop up hot spots to increase containment. The expected moisture in the forecast should help firefighters with their containment efforts. 5/16 afternoon update: Pre-Evacuation notice was lifted for the residents off CR 370 at 2 pm today. Crews continue to mop up hot spots along the fire perimeter to secure the fire lines. Due to the large patches of standing dead trees (snags), crews will allow the fuels in the interior of the fire burn. Residents can expect to see smoke and some interior fire activity in the next few days. 5/16 mid day update: Firefighters finished the firing of the indirect line about 1 this morning, all went well. Doing some fill in work around the burnout area where needed and securing the lines today. 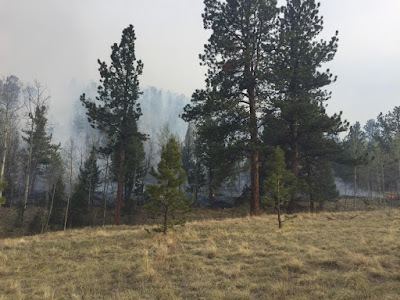 Still have 2 hotshot crews, the two juniper valley Department of Corrections crews, 1 Forest Service type 3 helicopter from monument, lake George Volunteer Fire Department water tenders, Forest Service hand crew modules, 2 Americorps crews, 1 Forest Service bulldozer, and misc. Forest Service engines assigned to the fire as well as a “short” type 3 team. Logistics is being run out of Lake George Volunteer Fire Department station one. 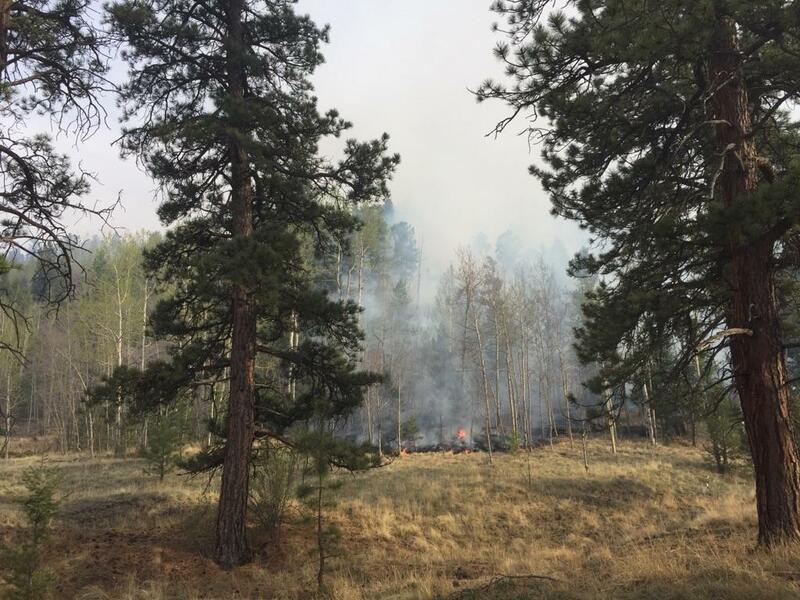 Firefighters will continue to patrol, secure and mop the fire perimeter and will not be doing mop-up over the entire fire due to snag hazards from the bug killed Douglas fir. Still anticipating at least some moisture from Wednesday night through Thursday night. There will be smoke visible for next few days. Estimated current size is 80-90 acres. Crews will get a better acreage later today after they walk the fire perimeter with a GPS unit. Some resources will be released back to the Forest for initial attack today. Pre-evacuation notices are still in affect but are being evaluated. 5/15 evening update: Additional resources arrived on the fire today including engines, a bulldozer and a hotshot crew. The crews along with the bulldozer completed a fire line as well as worked on securing some of the fire line that was built last night. Due to the large areas of standing dead trees (snags) along the fires edge there was a significant risk to firefighters working along some parts of the fire. Crews were able to utilize and improve some old roads and natural barriers to complete fire line with both the bulldozer and hand crews. That fire line was reinforced with two loads of fire retardant from a C-130 Air tanker. Crews have begun a firing operation off the line that was built to safely secure portions of the East side of the fire. Residents can expect to see increased smoke and fire activity as this operation is completed over the next few hours. This operation is expected to increase the size of the fire by approximately another 40 acres. This operation allows the firefighters to work along a safer fire line as well as making the fire line more secure. Crews will continue to monitor fire lines through the night. 5/15 afternoon update: Winds have increased and humidity continues to fall in the area of the Puma fire. This has increased fire behavior this afternoon. No new additional growth however there is active fire in the interior of the burned area and along the edges of the fire. Crews have been working with the helicopter all morning to cool hot spots as they work to put in additional fire line. The erratic high winds are making things somewhat difficult for the helicopter. If the winds continue to pick up, there is a chance the helicopter will need to be grounded. Additional crews have been ordered including two hotshot crews and two engines. A heavy Air Tanker has also been ordered and expected to arrive, weather permitting, later this afternoon. 5/15 morning update: Fire fighters report that the fire had no growth overnight. Firefighters were able to continue to build fire line last night in the areas where it was safe to work away from falling snags and gain 25% containment. The National Weather Service has issued a red flag warning for the Puma fire area for high winds and low humidity. This weather could increase the fire behavior today so smoke will likely be visible again today. Crews will continue to construct and improve fire line however Steep, rocky and inaccessible terrain is hampering efforts to complete some of the fire line. One helicopter will be working the fire today and the fire personnel has increased to 100. 5/14 evening update: Fire behavior has subsided from the torching and spotting that was observed upon arrival it is minimal creeping at this time mostly burning in heavy timber. Have released all county resources and the helicopter but the helicopter will be back working the fire in the morning. USFS firefighters will be working on the fire through out the night with two 20 person hand crews reliving the night shift in the morning. Evacuations: No evacuations. The Park County Sheriffs office lifted the pre-evacuation notice for the residents along CR 370 at 2 pm today. Firefighters are in the initial response stage, with the helicopter doing water drops. Surface fire with some signal tree torching. Further updates will be posted as known.